The Nantucket-style Cape Cod house at 411 Harbor Road is adorned with decorative millwork and molding inside and out, and its backyard includes gardens, terraces, and views of Southport Harbor. FAIRFIELD — The canvas that is the water of Southport Harbor and the large swath of sky above it provide the ever-changing artistic backdrop for life along the water front at 411 Harbor Road. Sunrises, sunsets, and the unpredictable New England weather colors the water and sky in varying hues every day, and often multiple times a day. This constantly-changing natural art “installation” can be viewed from most of the nine rooms of the Nantucket-style Cape Cod house that sits on this 0.77-acre level and sloping property. It is an enchanting retreat in the Southport section of town, and it includes a cottage or summer house situated on a bluff and a private dock. 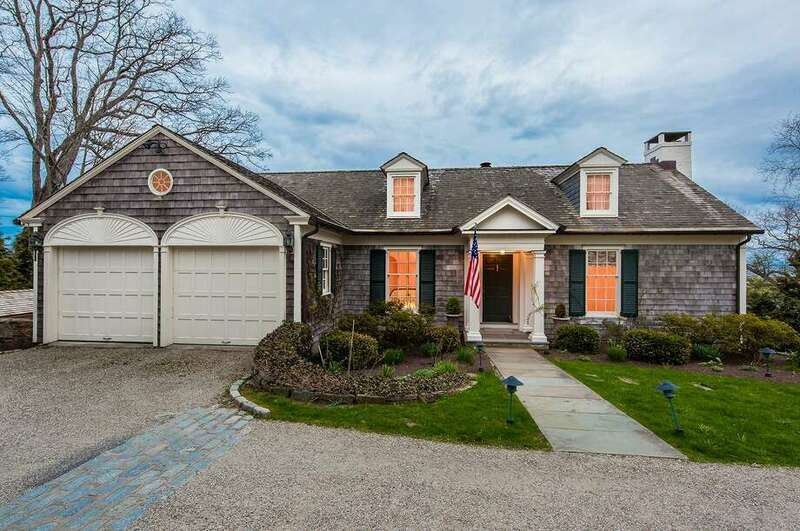 In addition to panoramic views of the harbor, Long Island Sound, and the Country Club of Fairfield, residents of this house enjoy easy access to those amenities and many others. The house is only steps from the Pequot Yacht Club and easy walking distance to Southport Village, the Southport Metro North train station, and the Pequot Library. Also nearby are Southport Beach, and a short car ride away is Post Road (Route 1) and I-95. The 4,449-square-foot classically appointed house was built in 1937 and it has many modern conveniences. It also has many attractive architectural features inside and out, all worthy of its beautiful setting. The front of the weathered wood shingle home with white trim and dark shutters is hugged by shrubbery and perennial flowers in the professional landscape, among them climbing roses as would be seen in Nantucket. The fluted columns and dentil molding of the covered front entrance offer a taste of the craftsmanship inside. The front door opens into an open foyer with a gracefully curved staircase that leads down to the main living level. On the entrance level there are three en suite bedrooms and a large office or library with butternut wood paneling and walls of built-in shelving and cabinetry. Its French doors, which separate it from the foyer, open and then fit flush into the wall blending into the paneling. On the main living level the sizable formal living room has a fireplace with a decorative wood mantel, built-in shelving and cabinets, nearly floor-to-ceiling windows, and French doors to a large sun room. In the sun room there are two walls of windows topped with transoms, a tile floor, and several doors to the expansive terraced slate patios and stone sitting walls. The powder room on this level has a decorative inlaid wood floor and floral-themes pedestal sink and commode. The spacious great room contains the family room, gourmet kitchen and eat-in area. In the family room there is a marble fireplace, built-in shelving and cabinets, and floor-to-ceiling windows with French doors to the terraces. Features in the kitchen include a center island with a breakfast bar for two, granite counters, a double stainless sink, wine refrigerator, a china pantry, and a hand-painted ceramic tile floral motif above the six-burner Viking Professional range with a griddle and double ovens. This level has the fourth en suite bedroom. Back on the upper level, the master bedroom suite features a tall, vaulted ceiling, a walk-in closet, and French doors to a private balcony from which to enjoy magical sunrises, watch water fowl swim and fly by, and view stunning water views any time of day. The marble master bath has a jetted tub and large shower. The cozy finished lower level has a bar, billiard room with a fireplace, an exercise area, and a half bath. This house has a dumb waiter that could help cart groceries from the garage to the hall off the kitchen. It is not currently operational but could easily be brought back into service. Among its many assets is the fact that, despite its proximity to the water, this house requires no flood insurance, according to the listing agent, because the house is atop a hill. For more information or to set up an appointment to see the house contact Karen Cross of Al Filippone Associates/William Raveis Real Estate at 203-521-7012 or Karen.Cross@raveis.com.